“Language is power, in ways more literal than most people think. When we speak, we exercise the power of language to transform reality.” This quote from American linguist Julia Penelope rings true, as the words we use can affect the way people think and act and can easily alter one’s perception. 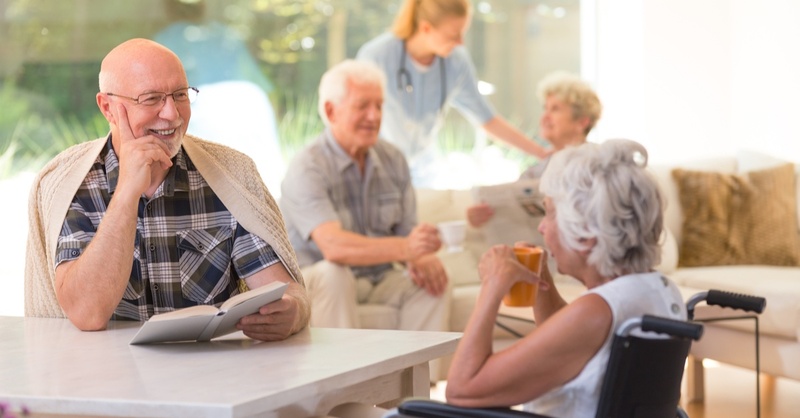 As we have grown more aware of how language affects our perception and have become more sensitive to issues around aging, the words we use to describe senior living have transformed. For example, the words we use to describe senior care are heavily outdated. Terms like ‘institutions’ and ‘facilities’ don’t bring a sense of warmth and comfort — they’re impersonal and add to the fears and misconceptions about the industry. Considering that the baby boomers are entering their golden years, people are making a fundamental shift in the way they use language to describe entering a new chapter of life. The size of the baby boomer generation means a larger number of people than at any point in history will be looking for new ways to cope with aging at the same time. This has and will continue to lead to large cultural shifts to make aging less daunting and more fun. Growing older and giving up certain freedoms is challenging, and impersonal terms can make people feel further removed from the independent lives they once lived. In the not too distant past, our aging population went to live in nursing homes when they could no longer take care of themselves. These days, people want more than just care; they are looking for communities that offer art and music, social events, community outreach opportunities, lifelong learning classes, and fitness programs. The language we use has and should continue to reflect these desires. Terms like assisted living, independent living, memory care, retirement living, and senior living are searched more frequently than Alzheimer's care, dementia care, nursing homes, or even the nomenclature slang, “old folks home”. This is a clear indication that a language shift is in motion. Along with a change in the way we describe these types of communities, there has also been a shift in the language used to describe the amenities, services, and staff. For example, what were once called “cafeterias” have increasingly become “restaurants or dining rooms” with associated services like all-day dining and made-to-order choices. “Nursing services,” which once focused exclusively on treatment have become “wellness programs,” with emphasis on preventative care. And at Weatherly Inn, the staff once known as “admissions” are now known as “Senior Living Advisors,” and are trained to help families find appropriate care, whether at Weatherly Inn or elsewhere. Outdated, impersonal language will make older adults feel more reluctant to move to senior living, even if it’s necessary for their new lifestyles. At Weatherly Inn, we understand how language can influence how a person feels. That’s why we’re dedicated to creating a senior living experience that feels like home. If you’re looking for senior living options for a loved one or for yourself, download our guide, ‘Senior Living Options that Make the Golden Years Sparkle’. Weatherly Inn offers retirement living, assisted living, and memory care communities in Tacoma, and a memory care community in Kent.